Treats common vitamin D deficiency, psoriasis, and rachitis. Prevents falls, osteoporosis, and muscle weakness. 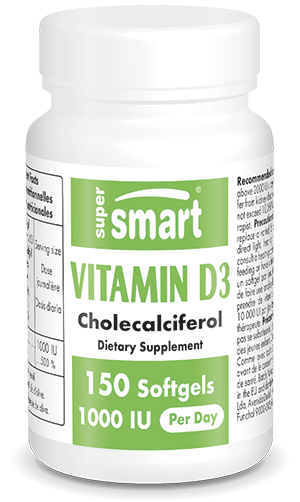 Vitamin D3, or cholecalciferol, is one of the two main variants of vitamin D, a fat-soluble vitamin. It is present in nutritional supplements in the forms D2 (ergocalicferol) and D3. In the liver, both are converted into 25-hydroxy-vitamin D, or 25(OH)D.
The role of vitamin D in bone health is long-established. One of its principal biological roles is to maintain normal calcium and phosphorus levels in the blood. By promoting calcium absorption, it helps to form and maintain strong bones. Over the last 10 years, research has demonstrated that vitamin D may offer a number of additional health benefits when given at the right dose. Scientific studies suggest that vitamin D may reduce the risk of 17 different types of cancer, including that of the colon, breast, prostate, ovaries, oesophagus, kidneys or bladder. It may even improve treatment outcomes for patients already diagnosed with cancer. Dr Cedric F Garland, a cancer prevention specialist at the Moores Cancer Center, University of California, San Diego, estimates that 250,000 cases of colon cancer and 350,000 cases of breast cancer might be prevented each year throughout the world by increasing consumption of vitamin D3. Studies suggest that vitamin D3 begins to have a protective effect when 25(OH)D blood levels reach between 24 and 32 ng/ml. According to these studies, a significant decrease in cancer risk might be achieved with a daily dose of vitamin D3 of 2000 IU. One study suggests that vitamin D may help prevent the recurrence, or slow the progress, of prostate cancer in patients who have already been treated for the disease. Vitamin D may improve survival rates for lung cancer patients. Vitamin D3 also has an immuno-modulatory effect. One scientific article hypothesized that seasonal infections such as influenza, could be due to the lower vitamin D levels typically seen during winter months, and not to an increase in viral activity. Low levels of 25(OH)D are associated with a higher incidence of hypertension, diabetes, obesity and elevated blood levels of triglycerides. In patients suffering from congestive cardiac insufficiency, daily administration of 2000 IU vitamin D combined with 500 mg calcium reduced levels of the pro-inflammatory cytokines partly responsible for their condition. In elderly people, vitamin D supplementation reduced their predisposition to diabetes by slowing down decreases in insulin sensitivity. It also significantly reduced the risk of falls in older persons. Vitamin D3 is generally well-tolerated in adults at daily doses up to 2000 IU. Several studies suggest it may be safe even at doses up to 10,000 IU/day, although health authorities have set the safe upper limit at 1000 IU/day. Scientists, however, believe a healthy adult needs close to 1000 IU/day.